Heart-healthy meals start with heart-healthy ingredients. Here are some tips for selecting and preparing foods that support heart health. 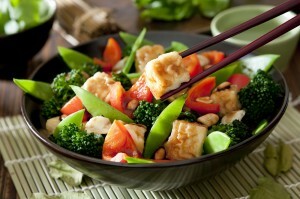 Eat plant proteins like tofu for heart health. To me, calling a diet “heart-healthy” is a bit misleading. It seems to suggest that a heart-healthy diet is somehow different from a more general “healthy diet” – but, in truth, they’re one and the same. A heart-healthy diet is one that calls for a variety of good-for-you foods – including lean proteins, plenty of fruits and vegetables, adequate amounts of fiber and modest amounts of sugar, salt and saturated fat. Sounds like a healthy diet to me. A heart-healthy diet not only supports the health of your heart, it also supports your overall health in a number of ways. Low fat protein foods keep you full, and give your body what it needs to build and repair important body proteins – all while keeping your total fat and saturated fat in check. The right carbohydrates give your body the fuel it needs, along with generous doses of vitamins, minerals and fiber. And, small amounts of the right fats contribute essential fatty acids and flavor. When taken all together, these foods make up a well-balanced diet that’s filling and flavorful. Whatever you choose to call it – “heart healthy” or simply “healthy” – this is a diet that promotes heart health, satisfies your taste buds and helps you keep your weight in check, too. Why: The protein that you eat every day provides the basic building blocks (in the form of amino acids) that your body needs to perform literally hundreds of functions. Protein is found in a variety of plant and animal foods, but – especially in the case of animal proteins – saturated fats often tag along. That’s why opting for the lowest fat choices is so important – less total fat also means less saturated fat. So, you’ll want to select from a variety of plant proteins and lean/low fat animal sources. And fish is generally a good choice since it contributes heart-healthy omega-3 fatty acids. What: Plant proteins such as lentils and beans – and particularly soy and soy products which are complete proteins (they contain the full complement of essential amino acids that you need to eat every day); eggs; fish and seafood; poultry (especially white meat); nonfat and low fat dairy products; lean cuts of meat. How to: Aim for several vegetarian meals per week that rely on beans, lentils and soy-based foods like tofu, soy chunks to provide protein; in recipes that call for meat or poultry, experiment with using tofu or seafood instead; replace high fat meats with lower-fat choices (ground poultry breast can replace ground beef, for example). Make use of flavorful marinades to tenderize low fat cuts of meat and poultry, and use low-fat cooking methods, too – bake, roast, grill, stir-fry or microwave. Why: Carbohydrates are the primary fuel for your body’s engine – and, when you choose the right ones, they can also provide your body with an abundance of vitamins, minerals, fiber and phytonutrients that are important to a heart-healthy diet. Their fiber content can also help fill you up, which can help you control your weight – which is also important for the health of your heart. Many fruits and vegetables are rich sources of potassium, which supports healthy blood pressure. And, some are also good sources of nitrate – a compound used by the body to make nitric oxide, which supports the health of your blood vessels. Unfortunately, many people get their carbohydrates from sugars and highly refined grains, which offer up much less nutrition and more calories per bite. What: Keep your focus on vegetables, whole fruits and whole grains (and products made from whole grains) to provide the carbs your body needs. Try to reduce your intake of sweets, juices, sugary drinks and refined grain products – white rice, and “white” flour products like regular pasta, white bread, cereals and crackers. How to: Aim for a fruit or vegetable at every meal and snack – add fruits and vegetables to your protein shake, and add veggies to soups, stews, casseroles and mixed dishes. Frozen fruits and vegetables are fine – they’re convenient and, since they’re frozen quickly after picking, their nutrient content is preserved. Choose whole grains – such as brown rice, barley, quinoa, wild rice, and oats – over refined grains, and select breads, pasta, cereals and crackers that are made with 100% whole grain. To retain nutrients in vegetables, cook by steaming, microwaving or stir-frying and season with your veggies with flavorful herbs, spices, onions, garlic or lemon rather than always relying on salt. Why: Your body needs small amounts of fat in order to function properly. What’s important is choosing the right fats, and keeping your overall fat intake moderate. In general, fats that are derived from plant sources are considered to be more heart-healthy than animal fats. That’s because plant sources are good sources of monounsaturated and polyunsaturated fats, while animal fats contain more saturated fats which tend to raise blood cholesterol levels. What: Nuts, seeds, avocado and olives are some of the best sources of healthy fats, as are the oils that are derived from these foods. Olive oil and canola oil are good sources of monounsaturated fatty acids (canola is a seed from a plant that’s related to cabbage, turnips and Brussels sprouts) and are great for cooking; small amounts of nuts and seeds (and the oils derived from them) can add a lot of flavor to dishes. Limit your intake of sources of saturated fats such as butter and shortening, as well as foods that contain a lot of animal fat such as cheese, fatty meats and ice cream. How to: Use olive and canola oil for cooking; use mashed avocado to replace foods like mayonnaise, sour cream or butter in cooking and at the table; use moderate amounts of nuts for snacks (heart-healthy, but the calories can add up); add a sprinkle of nuts or seeds or a drizzle of flavorful nut or seed oil to vegetables, salads or grain dishes. Susan Bowerman, M.S., R.D., C.S.S.D., F.A.N.D. – Director, Worldwide Nutrition Training at Herbalife. Susan is a Registered Dietitian and a Board-Certified Specialist in Sports Dietetics. Disclaimer - Views expressed are personal to the author, Susan Bowerman and Herbalife shall neither be responsible nor liable for the same at any time.